We’ve been making a lot of pesto lately. 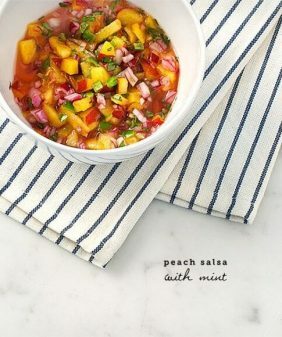 It’s one of my favorite ingredients, especially for lazy summertime cooking. 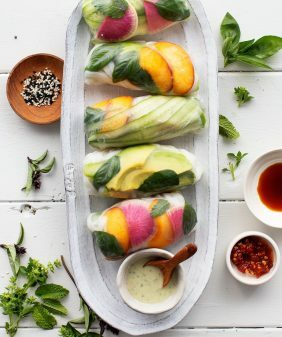 When I have it on hand, I like to dollop it on grilled vegetables, fish, meats, tofu, pasta, salads, eggs, toasted bread, pizza, sandwiches… you get the idea. With just a few easy steps, it makes anything an instant tasty meal whether you felt like cooking or not. What is pesto, and how do I make it? Pulse the garlic in the food processor until it’s finely chopped. Add pine nuts and herbs and pulse until they, too, are finely chopped. Next, drizzle in the olive oil with the food processor blade still running. Finally, add grated Parmesan cheese and process briefly until combined. That’s it! It’s really simple to make, and it’s easy to vary according to the season or your mood. Pesto will keep for a few days in an airtight container in the fridge, though its surface may start turning brown. As a result, it’s best to cover your pesto with a thin layer of plastic wrap before sealing your container. This will keep your pesto fresh and green! I have little sticky notes all over my kitchen scribbled with the various ingredients we’ve been subbing in (yes, that’s my organization “system”). Finally it occurred to me that I’m not going to send you to the store for a specific pesto recipe. Instead, I’ll share a basic recipe and then offer some ideas of how you can change it up. Swap out pine nuts for any nut of your choice! I particularly like walnuts and pistachios. 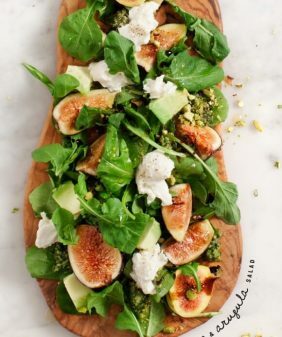 Use any herb or leafy green. I like a combination of parsley & cilantro, or use part basil and part arugula. Blanched kale leaves are also a great combination with basil! Don’t let your stems go to waste. Blanch kale stems and blend them into pesto with basil leaves or another herb. Punch up the flavor! Add sun-dried tomatoes, a roasted red pepper, a charred jalapeño, artichoke hearts, etc. I’m sure there are a million more ideas than the ones I’ve listed here, so if you have a favorite, feel free to share! The first thing you need to do is go look in your kitchen and see what you have. Since you probably already have some kind of nuts, herbs, or greens, use those as a starting point. More often than not, if I make a pistachio version, it’s not because I’m trying to be fancy. It’s because pistachios just happened to be the nut I had that day. If I have some arugula in the fridge that’s getting close to its last days, I’ll use that. Since I have two huge basil plants, a basil combo is a common go-to for me. 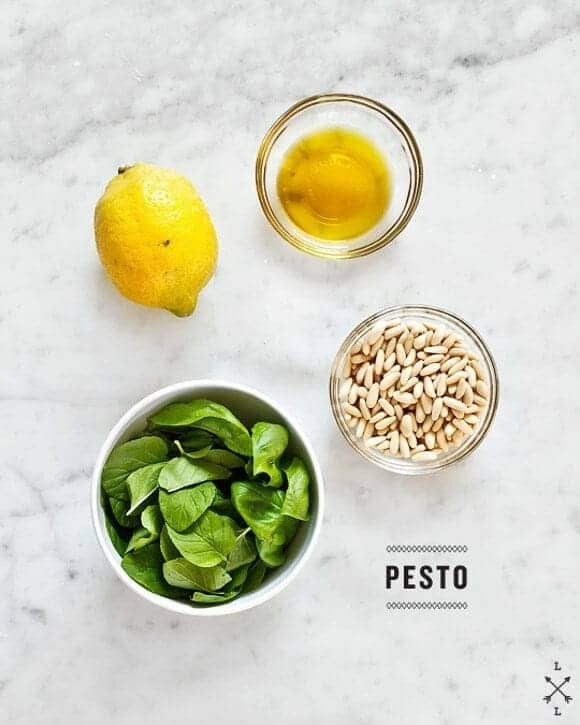 Add the basil, nuts, and lemon juice and zest and pulse again until everything is finely chopped and well-combined. Drizzle in the olive oil last while the food processor is running. If you don’t have a spout on your processor, just put it in last. Taste and adjust, adding more of any of the ingredients you used along the way until you create something you like. Every day I make a pesto, it’s slightly different. My lemon may have been more tart or sweet than another day, my garlic might have been more pungent, or my basil might be sweeter depending on what season it’s growing in. *If you want a thinner pesto, add more olive oil. If you want to go lighter on the oil, add some water instead. Also, if you have leftover pesto, it’ll thicken a bit the next day. Add water or more olive oil to thin it out. I find that I can keep pesto for about 3 days, covered, in the fridge. The one exception (given the choices above) is if you use an avocado. Avocado pesto will last only about 1 extra day. **Use unsalted nuts so you can adjust the salt level. 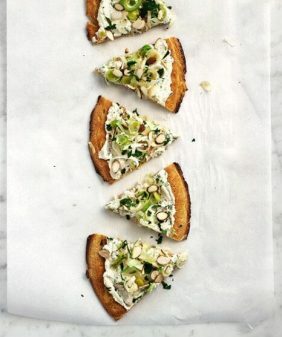 Toast lightly and let cool before blending into the pesto. 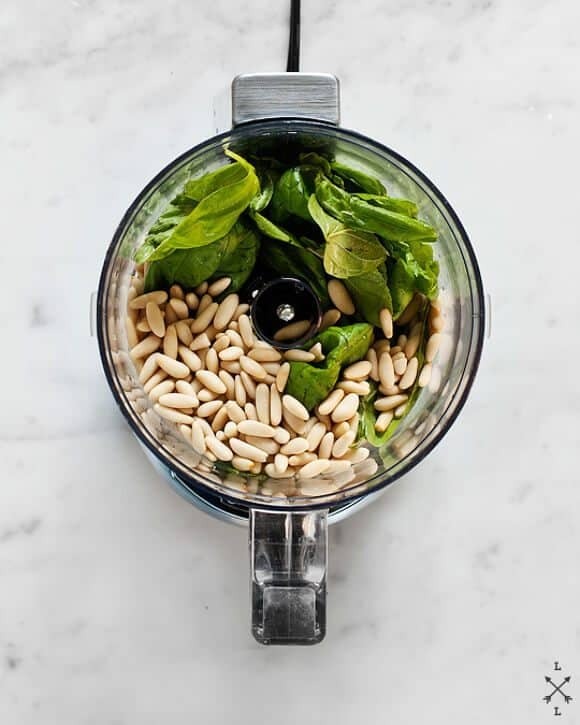 ***For a chunkier pesto, use a mortar and pestle. This way, you may need to use fewer ingredients depending on how large yours is. Just made some pesto last night. Love all your variations! You’re welcome… I’m sure it does something to emulsify, but it totally works fine without it. Even when I forget to put the olive oil in last and I mix everything all at once, it works out just fine. Great post. I thought arugula-pecan was my favorite, but then I made dandelion pesto. In addition to tasting amazing, it really holds its green color. I love a good pesto! It’s so versatile. PS I have the same organization system. Last night I brought home a big basil plant which I bought because I love basil and pesto. I found myself wishing this morning that I knew some interesting, delicious variations for pesto. Presto! Your post came this afternoon. When I finish typing, I’m going in to the kitchen to make, yes, pesto. Thank you. I’ve been doing the Green Goddess thing for the last few weeks, but I want to mix it up a bit, so I guess it’s going to be a pesto summer! I love these kinds of recipes, that are more like guidelines. Thanks for the tips! Fabulous post! 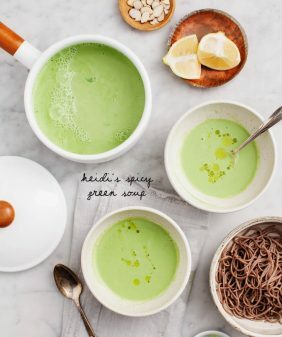 I’ve been loving your blog (ever since you featured one of my recipes here – thank you!) 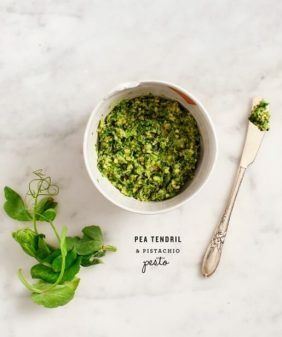 – and this is a wonderful post for the adventurous pesto lover! Thanks for the gorgeous shots, this is so elegant! great ideas! my favorite is ramp pesto, but sadly those are only around for a short time :(. I love pesto. So I’m into this. It’s so darn versatile! I’ve had a lot of fun this year experimenting with pesto. My favourite version used sunflower seeds which I always seem to have on hand in vast quantities. There is such a world of difference between home made pesto and store bought pesto that it’s very hard to go back. Ah yes, I’m going to add sunflower seeds to the list, love them. I love these suggestions. I’m eager to try adding avocado to some pesto. My basil plants have been going crazy lately so I’ve been stock-piling my freezer with pesto to get me through the basil-free winter months. A couple of my favorite non-basil pestos are ramps with walnuts, as well as arugula with goat cheese. My favorite pesto these days is made with garlic scapes (also not in season very long…) along with almonds, olive oil, and some sea salt. The scapes add bulk to the garlicky flavor and a lovely green color. Wonderful post. Thank you! Eeeeek…lemons on th marble LOL! Thanks for taking the time to take to me I appreciate your generosity. I hope my food looks half as good on our counter. Great idea! Love all the fantastic substitution suggestions. Pesto just SCREAMS summer to me. I can’t wait to take my basil crop and make a fresh jar of pesto to last me throughout the winter months. Is it scary that I’m excited to kill all of my basil? At least it’s for a good cause. 🙂 Cheers! I made arugula pesto just last night. Basil is still my favorite kind, but this was refreshingly pepper-y from the greens. Coming to my blog later this week. Mmm, just what I need for dinner tonight! We love fresh pesto tossed with pasta (homemade on a good day). Don’t you just love summer and all the fresh food it brings with it? I love pesto too! Thank you for your tips. I use to use almonds or sun dried tomatoes and they really work very well. Recently I tried pesto made with almond and capers, it was very good! Your blog is awesome!